What is the given tag line when T.V. cops are looking to find a criminal act? Follow the money. Well the publicly elected person that oversees the cities finances has called a foul on Mayor Deborah Robertson & City Clerk Barbara McGee. Accusations of gifts of public funds and misuse of city employee’s duties has led Edward Carrillo to file a complaint with the San Bernardino County District Attorney’s Public Integrity Unit on the actions of the Mayor and City Clerk when it comes to private events that get thousands of public tax dollars to fund them. If the mayor had your neighbors roof repaired and repaired their bathrooms would that be a proper use of tax dollars? Below is a snap shot of one of many pages to Edward Carrillo’s complaints to the San Bernardino County District Attorney’s Public Integrity Unit asking for an investigation into these tactics. 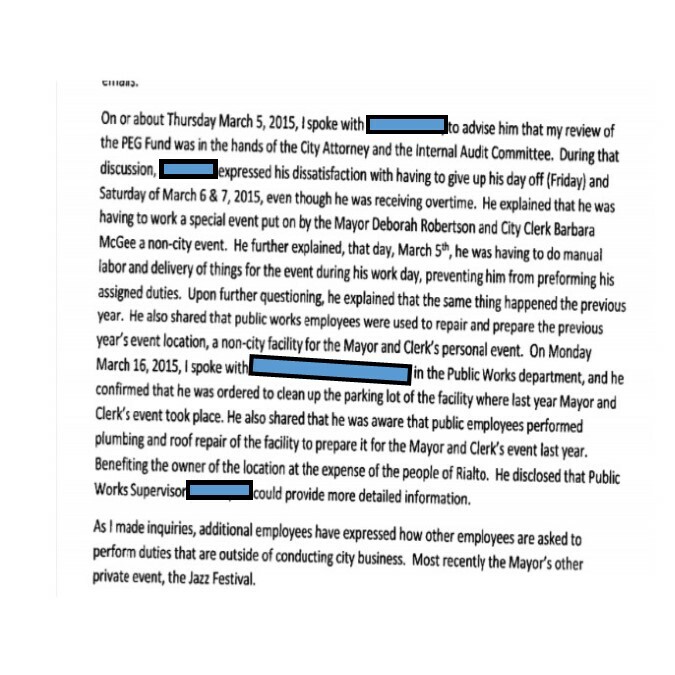 Edward Carrillo says that the money spent over the years on events like those below were a misuse of public resources for their personal gain or benefit. So in a scramble to make these charges null and void the Mayor is trying to get the city council to call her events city events and not just into the future but PRIOR events as well. Mayor Robertson believes that if she can get two of her colleagues to go along she can skirt the investigation by the public integrity unit. What this has done is force the Mayor, City Clerk and other Council Members to try and cover their tracks. The sad part is Mayor Robertson is lumping these events geared to promote her in a positive light in the community with real city events that are of a community interest. Below are a few of the many REAL public events that Mayor Robertson is using as leverage to get her private events approved. What is sad is in the two events above that shows another $10,500 that could be used to highlight Rialto Athletes or Really make a summer series that people want to attend. Mayor Robertson should remove herself from the room as she has a conflict of interest in this item. Any Council member that try’s to help the mayor avoid a investigation by voting these two events in should be put on notice that this will effect re-elcetion. Roberto told us “its not fair that the people we elect spend more time trying to hurt us rather than help us. Speaking of the election when looking for a photo for this story we stumbled on a story that Josh Dulaney did on the win over Ed Scott. 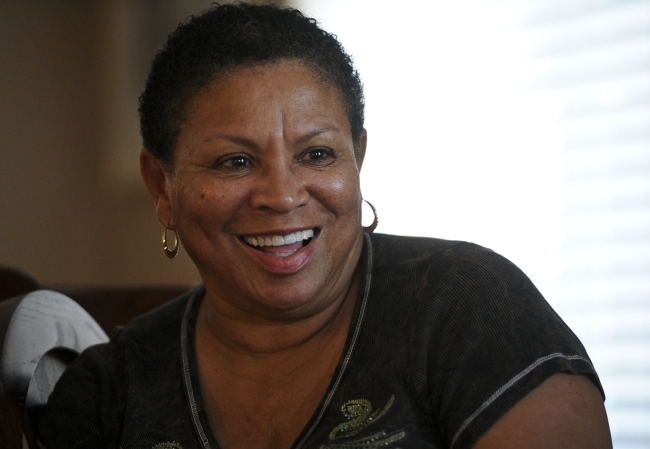 Robertson didn’t hesitate in saying she will bring a different kind of leadership than Vargas, who had a reputation for being swayed by other council members when it came time to vote. Robertson pledges to bring transparency to City Hall, and says the top priorities are jobs, economic development, a healthy community and open space issues. How is spending public money on non city events transparency? How are you leading if you are not listening to your colleagues?